We had often talked about Pompeii and Herculaneum and we felt it was time we visited the sites on our own. So, I think it was British Airways who organised our flights and hotel, and off we went. We decided to make Sorrento our base and had booked to stay at the Grand Hotel Excelsior Vittoria. Very classy with the most magnificent views from our balcony, its own swimming pool, not that we had time to use it, and its own lift down to the bottom of the cliff. We first took a boat to Capri and took a chairlift to the ruins of the Emperor Tiberius’s villa. There were sensational views from the chairlift as we climbed to the top, at one point, to our unease, it stopped for quite a length period. To be left hanging over a cliff, wondering what on earth was happening was a bit heart stopping, but soon the tranquillity of the place soothed us down and eventually the chairlift continued its journey to the top. The ruins were extensive and it was almost impossible to reimagine what the original buildings must have been like. We picnicked in a shaded grove of trees. On our return the boat took us on a visit to the Blue Grotto. We were placed in a small rowing boat with a couple of others and rowed into the Grotto, before entering we had to almost lie down in the boat as the entrance was so low, and very wet it was in the bottom of the boat. The Blue Grotto was enchanting and yes, very blue. Vesuvius. The next day we decided to visit Vesuvius, so we got the train to Herculaneum, got out and did not have a clue as to how we were going to go up to Vesuvius. Outside the station we were faced with a rank of taxis, all of whom seemed to want to take us up Vesuvius, but I had read that there was a chair lift, all very confusing. There was an old boy standing outside the station, amongst this mêlée, I do not know who he was, he was certainly not an official, I think he just came there every day probably to be of use, or maybe he just happened to be there when we arrived. Anyway, he took us in hand, literally, showed us to a taxi, grabbed two other people, two young, incredibly dashing American sailors who happened to be by also wanting a ride and pushed us all into the taxi. He then sorted out how much it would cost, with what appeared to be much haggling and eventually came to us, told us the price, which seemed very reasonable, and said that on no account were we to pay the taxi driver when we got out as the price was a return price and we should only pay him when we arrived back at Herculaneum or we would probably not see the taxi driver again. We tried to tip him but he refused, raised his hat and wished us a good trip to Vesuvius. We never saw him again. Then followed the most hair-raising ride we have every experienced, the taxi, tore up this narrow track, ripped around blind corners with inches to spare on the road which had no barriers and a dangerous precipice on our side. William was sure we were going to die, but I decided with the sailors, that if we did, we would go out enjoying it. Oh, and the taxi driver also kept on stalling, just to add to the frisson, stalling on a blind corner with hundreds of feet dropping away at the side of the road is not for the squeamish. We got to the chair-lift. Taxi driver demanded his money but we refused and insisted he wait for us. He was none too pleased but he did. We then took the chair-life to the edge of the crater. Here we joined a party with an official guide who took us around the crater, but he was not content with a simple safe walk, no we had to all walk down this scree covered pathway down into the crater, in order to feel the heat and see some of the small fissures. Health and Safety, where were you. We all scrambled down this perilous path; if one of us had tripped or slipped they would have taken the rest of the party down into the depths of the crater. I shudder to this day when I think of that short walk over the top of the crater. And I have a photo of the back of William’s head as we made our way down. We made it back safely, thank goodness. I don’t know whether we were pleased to see our taxi driver or not on our return journey, but we made it safely back with the dashing American sailors. On the edge of the crater, Vesuvius. Herculaneum. Still a bit shattered we then visited the ruins of Herculaneum. I did not realise that only a small portion of Herculaneum had been excavated. The town of Resina sits on, and hangs over, the unexcavated portion. The houses that have been excavated are more intact that most of those at Pompeii. I recall being impressed by the House of Neptune and Amphitrite with intact mosaics and the Serpent Fountain, a delicate intricate affair and the pillared Palaestra. Pompeii. We set off early in the morning by train and visited Pompeii. We began our visit , not at the main entrance but what I think was a rear entrance, and went to the Villa of the Mysteries to see the remarkable wall paintings in the dining room. They were known to us from books, but to see the sheer size and that vivid reddish background. One of those moments when you gasp on entering. Very claustrophobic and oppressive. It shows some sort of initiation ceremony, no one has really worked out what is happening but it is clearly something rather serious and unsettling. Very strange! We had the place to ourselves, something which I doubt happens today. We walked into the town down the rutted streets with lizards flitting about on the stones and with the ever present Vesuvius in the background. Visited the Forum. Visited many of the main buildings, were impressed by the House of the Faun and strange places like the bakery. What came as a surprise was the Amphitheatre (80 BC) virtually intact and the theatre which apparently held something like 5000 spectators. It was also remarkable to actually see the deep ruts in the streets where chariots had worn the stone down and the raised stones across the streets for people to cross. Had a picnic lunch and the crowds increased and it became very hot and uncomfortable. We returned to our delightful hotel room and settled down with a cold drink. We went on a coach tour to Paestum which took in Solferato, with its extraordinary stinking hot sulphur springs. Paestum. Nothing had prepared us for this incredible site dominated by three major Doric temples dating from the first half of the 6th century BC. 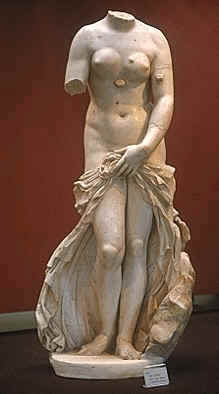 Dedicated to Hera and Poseidon, the temples are set among wild grasses, flowering trees and roses, we were bowled over. The herbs under our feet scented the air. We had the most perfect day in which to visit. The oldest temple is dedicated to Hera and was built about 600 BC by the Greek colonists. The second temple also dedicated to Hera but called the Temple of Neptune, also built by the Greeks in 460-450 BC. The scant remains of the Roman Forum was built on the Greek agora and there are a few remains of a small Roman temple dated 200 BC and an amphitheatre. Some way apart from the other temples is the Temple of Athena (500 BC). Only a small portion of the city has been excavated. Most of the wonderful sculptures found in and around Paestum and finds from the Paestum tombs are now displayed in the small Museum attached to the site. These include some of the dramatic metopes full of moving figures found at a sanctuary north of Paestum near the River Sele. Naples. We caught a train to Naples to see the Palazzo Reale di Capidimonte and its collection of paintings. We got out of the station to be met with a horde of taxi drivers all pushing themselves upon us. We turned away and walked down the crowded taxi rank till we found a taxi driver who was reading a newspaper who obviously did not wish to join the throng of pushy drivers at the entrance to the station. He took us to the Palazzo. We had come armed with a picnic supplied by the hotel, hoping to have one in the grounds of the Palazzo, but were shocked to find the grounds looking like the city rubbish tip and public toilet so no picnic area in those gardens. Anyway we went into the gallery and saw its magnificent collection, Titian, Botticelli, Raphael and many others. In all a staggering collection. I don’t remember where we found a place to eat our picnic, but I think we found a bench somewhere overlooking the messy gardens. How to get back to catch our train? We wandered down through the gardens and found a busy street, and then tried to find a taxi. Every taxi was full, the traffic was at a virtual standstill and the clock was ticking for us to get the last train back to Sorrento. One taxi driver going in the opposite direction waved to us to indicate by his open hand that he would be returning in five minutes. We waited, goodness know how long, eventually he did arrive, we had by then very little time to get our train and the traffic was at a standstill. We explained about our train, he then shot off at great speed driving on the pavement in suicide mode. We arrived in time for our train and tipped him heavily. Our second crazy death-defying taxi ride of the holiday. Caserta. On our last day we decided to see Caserta, I cannot recall how we got there but get to the Palazzo Reale in Caserta we did. Built by Charles III (1716-1778) and boasts as being the largest royal palace in Italy; was it over a 1000 rooms? It has been described as ‘the swan song of the Baroque’. We staggered through the palace, vast room after vast room, gold and gloom everywhere, thousands of paintings and I do not think we saw one of any merit. Painting were here displayed by the gilded mile. It really is one of the most preposterous palaces we have ever visited. It even has its own spectacular theatre. The gardens were a delight, if on a rather massive scale, statues and fountains everywhere. The Fountain of Diana and Actaeon was a stunner. Somehow, we found our way back to the hotel in Sorrento and then caught our train to the airport. Orkney Islands. In September we decided to visit the Orkney Islands. So we set off by car for the north coast of Scotland. How William could face these incredibly long drives amazes me still. Anyway, after a couple of stops on the way we eventually reached, and stayed the night at Thurso and the next morning we drove the car to Scrabster and onto the ferry and set off for Stromness. The weather was perfect and we passed the Old Man of Hoy, an isolated columnar rock stack which rises to 450 feet. We stayed at a pub/bed and breakfast for the week, very comfortable, a small cosy sitting room for the few guests, wonderful food and they prepared picnic lunches for us each day. The lunches were served in a large disposable tray affair with scoops for the various picnic foods. One held the cutlery, there was one for cold meats another for salads, then there was always a trifle in another and so on. We were also provided with flasks with hot coffee. So off we set each day armed with our picnic. The weather was perfect throughout our stay, very cold stiff winds but with blue skies and large scudding clouds. Kirkwall. We visited the extensive ruins of a palace built in 1607 for Robert Earl of Orkney. It must have been a remarkable building in its day, and has been described as ‘the most mature and accomplished piece of Renaissance architecture left in Scotland’. On a tidal island which we crossed, it fortunately being low water, there is a ruined Romanesque church of St Peter’s with remains of Viking houses. We visited St Magnus’s Cathedral begun in 1137, very impressive if a little stark; Cromwell’s soldiers having knocked it about a bit. I seem to remember there were quite a few interesting tombs. Next door to the cathedral is the Bishop’s Palace, very extensive ruins (12th century), with a spectacular round tower added in the 16th century. We travelled north-west of Kirkwall to the coast at Aiker Ness to visit the Broch of Gurness, an, Iron Age broch tower, the remains only 10 feet high but very impressive and encircled by a deep rock-cut ditch. Skara Brae. Skara Brae, is a stone-built Neolithic settlement in the Bay of Skaill, consisting of eight clustered houses occupied from roughly 3180 to 2500 BC. Older than Stonehenge or the Great Pyramids the site was discovered in 1850 and is truly remarkable. Most had primitive stone dressers and areas which were obviously used for bedding. The site is nearer the sea then it was and was probably served by a freshwater lagoon protected by sand dunes. Many of the houses had been washed out to sea which has slowly encroached on the site. Maes Howe. c.2000 BC. We got to this huge grass covered earth mound but the gate to the interior was closed and we were informed by a notice that we needed to call at a nearby farm for the keys. So we walked to the farm and one of the ladies of the farm accompanied us to the cairn with her large key. Maes Howe is regarded as the finest megalithic tomb in Britain and is supposed to surpass anything of its type in Europe. You first walk down a long stone passage which leads into a corbelled burial chamber with three cavities or cells in the walls for the burials. Remarkably large interior. Onston chambered cairn. 2000 BC. A circular mound with three concentric walls covering a megalithic burial chamber divided by upright slabs into five compartments. Cuween Hill Chambered Cairn, (2000 BC) This passage tomb contained four cells. Bronze Age Stone Circles. (c.2000 BC). Ring of Brogar. Magnificent stone circle of upright stones with an enclosing ditch spanned by a causeway situated between Loch of Harray and Loch of Stenness. Ring of Stenness, remains of a stone circle standing on a mound on the southern shore of Loch of Harray. It was very cloudy when we arrived but then it became the most beautiful day when we went to view the circles, brilliant blue sky with fast moving white clouds. We were the only visitors at both sites. 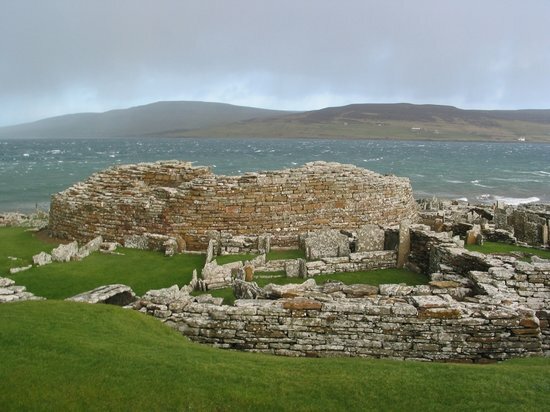 Scapa Bay. South of Kirkwall is the sandy Scapa Bay, near the western shores of which the road overlooks Scapa Flow, the famous naval anchorage used during both world wars. It was in the bay that the surrendered German Fleet scuttled itself and we could still see rusty parts of ships sticking out of the water. Very strange. Isle of Rousay. We decided that we would like to visit one of the other islands, so early, very early, one morning we went to Tingwall, from what I can remember there wasn’t much there but the ferry. We left the car and boarded the ferry, and settled down among a box of noisy hens, a refrigerator and various other household items and boxes and presumably the post. I think the journey was about 20 minutes or so. Again a beautiful day, provided you were warmly clothed. We were. We had arranged by telephone that someone would meet us by car and take us to the far northern part of the island to the Mid Howe Brock. The car picked us up, delivered some groceries to a farm, picked up an elderly lady on the way and also a young boy, both were dropped off and eventually we were at the Brock. We had reckoned that we would walk back to the quay for our return journey visiting a string of burial chambers on the way. Needless to say there was no one at the site of the broch, except for a crowd of seals all of whom plunged into the sea and then lined up in rows, their head bobbing up and down in the water to watch us. I don’t know whether we ruined their day on the beach or enlivened it for them. Mid Howe Broch and Chambered Cairn. The Iron Age Broch tower, very little standing, was situated on a promontory cut off by a deep rock-cut ditch. All the brochs we have seen in Scotland have a strange fascination. To think that people needed to build such massive structures for their own and their animal’s safety, what terrifying times they must have lived in. We then made our way to nearby Mid Howe Chambered Cairn again 2000 BC. It was massive, 32 x 13 metres. No top to it but consisting of three casing walls and with a central chamber divided into 12 compartments containing slab benches. Twenty-five individuals were found inside the cairn. We sat on the small beach and had our delicious picnic lunch closely watched by rows of seals. We then started our walk back to the quayside/ferry and when we looked back the seals had all begun to return to the beach. I hope that we were as entertaining as they had been to us. Blackhammer Chambered Cairn was a long cairn (13 metres) with a well preserved retaining wall, the burial chamber divided into seven compartments. Apparently the bones of two adult males were found in one of the compartments when it was first excavated. Taversoe Tuick Chambered Cairn. This burial mound is on side of a hill. It consists of two chambers, one above the other and each is entered from the opposite end of the mound. The lower chamber has four compartments all fitted with shelves or seats, the upper chamber had two compartments. We arrived back at the quayside and noticed that the whole beach was covered in millions of scallop shells. The ferry arrived exactly on time and we found somewhere to sit and talked about our adventures with some of the other passengers who I have a feeling thought we were slightly bats looking at burial mounds all day. But we had had a splendid time and drove to back to Kirkwall having had a quite perfect day. whether I was going to be sea sick. I wasn’t. 1977 – May: Sicily. Taomina. We went on a tour of Sicily and flew to Taomina and began our trip by staying at a beautifully situated hotel, the Grande Albergo Capotaormina built in a brutalist modern style on rocky cliffs jutting out to sea. We visited the famous Greek theatre originally erected during the Helenistic period but entirely rebuilt by the Romans with its unbelievable background of Mount Etna and the Calabrian Mountains. I forget the sequence in which we visited the various cities and sites but the following will give some indication of the range and the fact that we eventually saw a great deal during our tour of Sicily. Tindari. Tindari was founded by the Greeks in 396 BC and is built on a hill out on a promontory in the bay of the Tyrrhenian Sea. There are quite extensive ruins of a basilica with a monumental entrance to the agora, a bathhouse, a Roman house with mosaic floors, displayed under a tacky plastic roof and the very well preserved 4th century BC theatre much altered by the Romans with a magnificent view out to sea. Cefalu. We came here to see the Cathedral begun by King Roger II in 1131, and which is situated below a massive craggy rock. The interior of the cathedral is breathtaking with it sixteen columns with heavily carved Byzantine and Roman capitals. 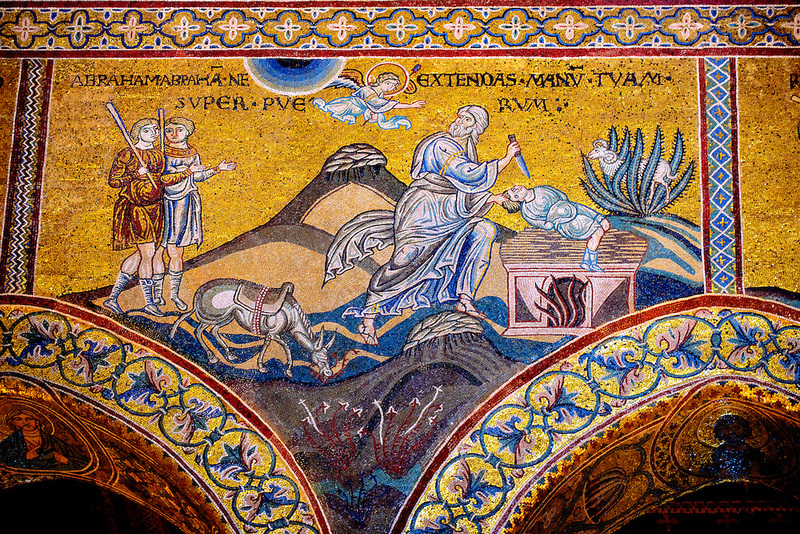 And then there are the Byzantine mosaics. 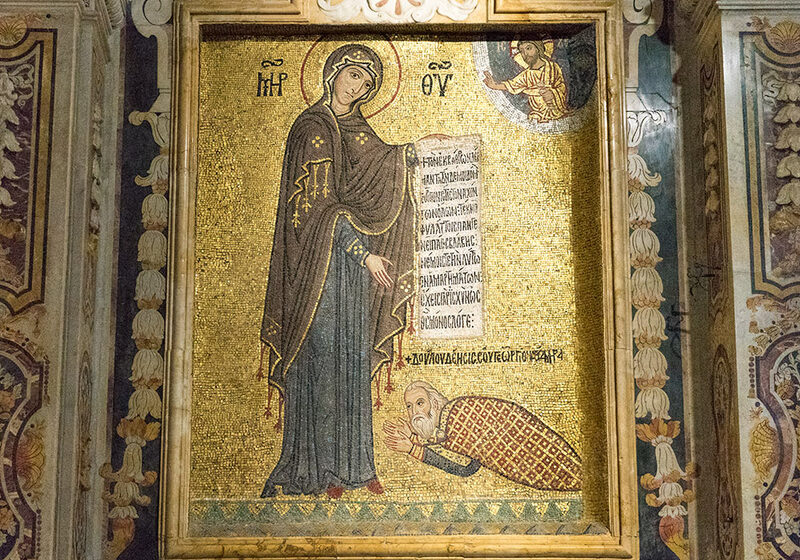 These mosaics are considered some of the finest creations of the Byzantine period and cover the east end of the presbytery and the apse, they are dated to 1148. Your eye is instantly drawn to the titanic half-figure of Christ, in the conch of the apse, beaming down the whole of the interior and hovering over the Virgin, angels and apostles. At the sides are rows of saints and prophets. Fortunately they are scraping away all the Baroque excretions in the cathedral and in fact our visit was marred by the scaffolding cluttering the interior. There was also a charming cloister with twin columns and planted with palm trees. Palermo. In the centre of Palermo is the Piazza Pretoria swamped by a vast hoot of a 16th century Florentine fountain over populated by nymphs and river gods. La Martorana was founded in 1143 by George of Antioch, the admiral of King Roger, and much altered during the centuries. It is quite a messy looking building from the outside with strange orange domes and a truncated campanile. During the alterations they fortunately preserved from the old portico a stunning mosaic of King Roger II crowned by Christ, the only known portrait of the king and a messed up mosaic of George of Antioch with the Virgin. The mosaics are of the highest artist quality and the cupola has a mosaic of Christ with the Archangels. Palermo Cathedral. Founded in 1185 it stands on the site of an earlier church which had been converted into a mosque by the Arabs and in fact one of the columns in the entrance portico bears an inscription from the Koran and may well have been a survival from the conversion of the earlier church into a mosque. Sadly the cathedral was ‘Barocqued’ in the 18th century. The great treasures are however the Royal Tombs. Four of them are canopied and two are set into the walls. They contain the remains of Sicily’s most famous monarchs. The porphyry sarcophagus supported by two pairs of lions, has the remains of King Frederick II, and is crowned by a canopy supported by six elegant porphyry columns. Frederick shares his tomb with the Arogonese King Peter II, though goodness knows why. Another much plainer porphyry sarcophagus with an elaborate canopy with marble Corinthian columns contains the remains of the daughter of King Roger II, Queen Constance (d.1198) the wife of King Henry VI of Sicily. Her magnificent bejewelled diadem was removed from her sarcophagus and is on display in the cathedral museum. Constance of Aragon (d.1222) the wife of the Emperor Frederick II is buried in an incongruous Roman sarcophagus showing a rather busy lion hunt. Another porphyry sarcophagus houses the remains of King Roger II (d.1154) beneath a mosaic canopy. This blazing jewel of a chapel one of the most important pieces of Norman/Saracentic art was built by Roger II (1132-40). There are ten antique columns in the nave and there is a raised choir and a semi-dome over the apse and a cupola. Another magnificent Christ is in the semi-dome which draws all eyes. 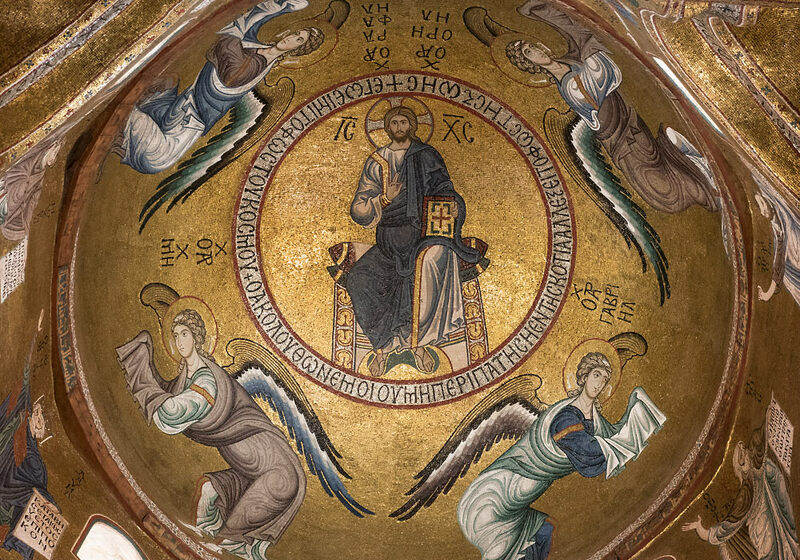 The cupola has as its centre Christ Pantocrator accompanied by angels and arch-angels. Everywhere is covered by saints and prophets, and scenes from the bible; everything glittering in gold and blue, scarlet and green. The ceiling of the nave is an example of the finest of Arab craftsmanship full of star patterns, and stalactites painted with Arabic inscriptions, flowers and animals. Sadly we were not able to see the Royal Apartments as there was some sort of society wedding being performed. Palazzo Abbatellis: National Gallery of Sicily. 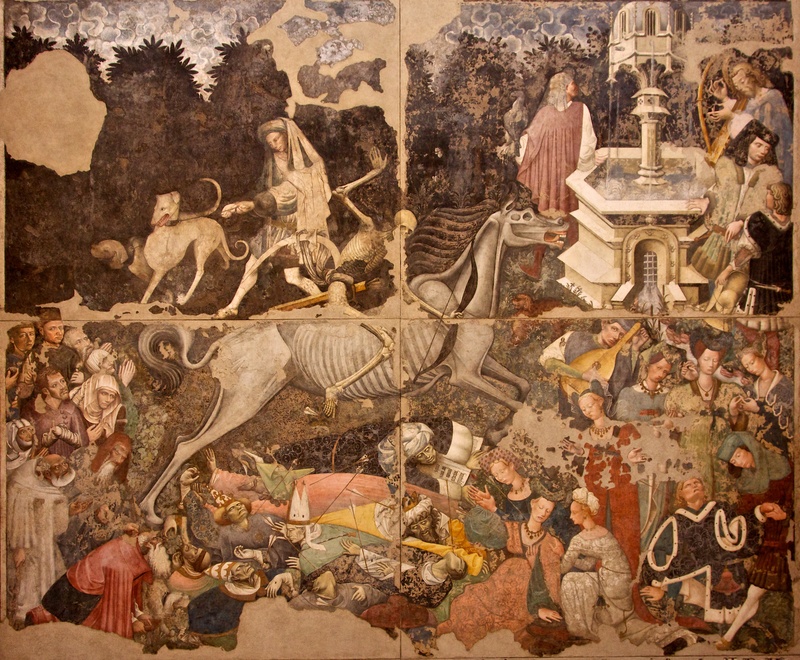 Ten rooms of Sicily’s finest paintings, I recall a massive fresco of The Triumph of Death (15th century). Most of the artists were new to us, many being by the Master of this or that. However there was an Annunciation by Antonella da Messina, Sicily’s greatest painter which stood out and a Mabuse triptych of the Virgin and Child with musical angels and saints. National Archaeological Museum.Has a huge collection of Greek, Roman and Egyptian pieces. The finest pieces are the Metopes of Selinus from various Greek temples. Catacombs of the Cappuccini, Palermo. 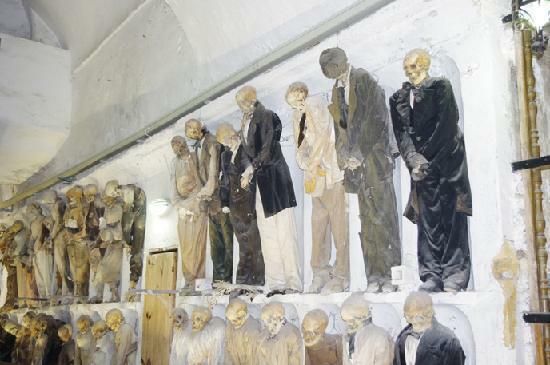 We had some spare time and happened to be passing these notorious catacombs and curiosity got the better of us. The so called catacombs consist of a series of rooms, corridors and hallways where the bodies of the wealthy of Palermo were interred by being placed in open coffins or hung on a hook from the wall all dressed in their funeral garments and in various states of bad mummification; grotesque and sickening figures, with skin falling off their sculls. One of the worst things we have ever seen. High marks for our poor taste in visiting this foul place. Monreale Cathedral. From Palermo we visited the town of Monreale to see the great Cathedral, regarded as the most beautiful church in Sicily. 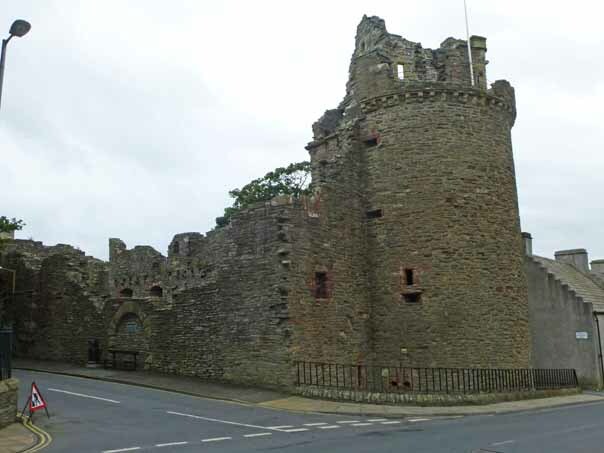 It was built in 1174-6 during the reign of King William II. To start with there are two 12th century bronze doors. The nave is composed of 18 slender Roman columns and the walls are covered in golden and coloured mosaics. The cathedral is the Capella Palatina in Palermo writ large. 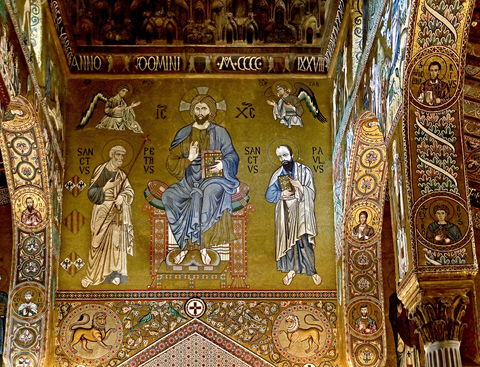 The mosaics were completed in 1182 and are presided over by a massive Christ Pantocrator in the semi-dome of the apse. Beneath the Christ is a Madonna and saints. Everywhere else is covered in mosaics of the creation, the teachings of Christ, the Passion, preaching of saints Peter and Paul, etc. There is even a mosaic of Thomas a’Becket made within ten years of his martyrdom (Henry II of England was William II’s father-in-law). Above the royal throne there is a mosaic of William II receiving his crown from Christ and above the episcopal throne William offering the cathedral to the Virgin. Abraham about to slaughter his son Isaac to please his God. 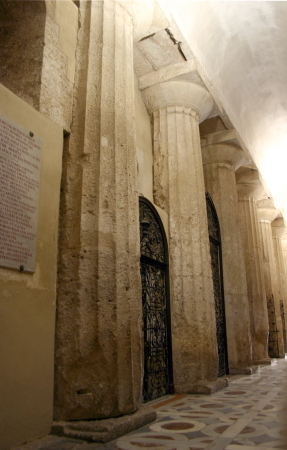 The chapels contain the porphyry sarcophagus of William I (d.1166) and the white marble sarcophagus of William II (d.1190). The cloisters are one of the glories of Monreale Cathedral. Twin and triple columns surround a beautiful garden in one corner of which is a fountain composed of a basin from which sprouts a single decorated column topped by a cluster of lion-headed spouts. The columns are either carved or inlaid with mosaic patterns supporting pointed arches. The capitals are elaborately carved and the sculptors were clearly allowed their imaginations to run riot. There are scenes from the bible, mythology, everyday life and whatever else they cared to depict. One column is actually signed and another has a carving of William II presenting the cathedral to the Virgin. Segesta. On a misty morning we visited the ancient site of Segesta. The whole site was covered in wild flowers and scented herbs. We were the only visitors and everywhere was very quiet and mysterious, and surrounded by hills. We first visited the temple which is on the crown of a hill and is considered to be one of the grandest of existing Doric temples. constructed between 424 and 416 BC it has 36 unfluted columns standing 30feet high. It seems that the temple was never finished and was never roofed. This is no wonder when you read of its troubled and bloody history. The city was finally destroyed by the Saracens in the 10th century and became uninhabited. We then walked some way to see the 3rd century BC theatre which is situated on nearby Monte Barbaro. There are quite extensive remains with 20 rows of seats with the most magnificent view of the countryside and a distant view of the sea at the Gulf of Castellammare. 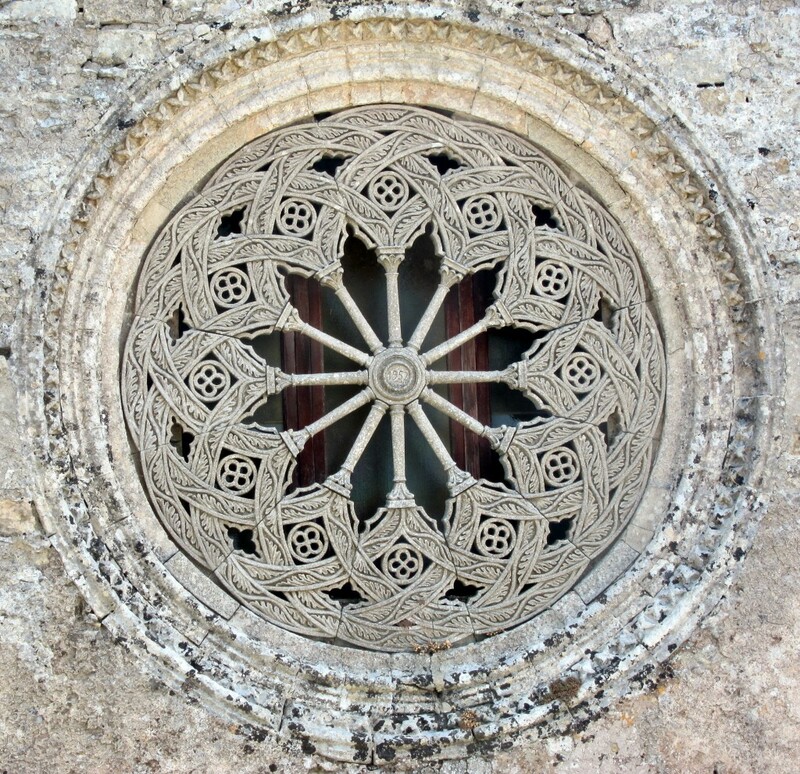 Erice. The only poor weather we experienced was at Erice, a town which is perched on top of a hill and was covered in misty rain the whole time we were there. We stayed at a ghastly hotel which was freezing cold. We visited a vast Norman castle which sits on the edge of a cliff which formerly occupied the site of the Temple of Diana. The town seemed to be deserted, the streets lined with inhospitable high walls, no one to be seen. We were told by our guide, that gardens and beautiful courtyards lay behind the walls. Apparently the Phoenicians first settled here and worshipped their goddess Astarte. The temple to Venus was supposed to have been founded by Aeneas no less. The temple became famous for its magnificence and was embellished by both Emperors Tiberius and Claudius and became one of the great shrines of the Roman world. Hardly a stone remains except for fragments which are embedded in the masonry of the castle. Apparently Mussolini took a shine to the place and revived the town as a tourist destination, not that we saw a single tourist, or indeed anyone other than the occasional scurrying figure disappearing into one of the doors of the forbidding walls along the streets. We visited two of the churches, one Gothic the Chiesa Madre (1314) with a detached bell tower, and a magnificent carved rose window, and the Medieval Church of Saint John the Baptist. I am sure on a good day there must be marvellous views of mountains and sea but the mist ensured we saw nothing. Marsala. On reaching Marsala, we began with a splendid lunch and of course sampled its famous wine, not to my taste, I have to say. Instead of visiting the cathedral to see its splendid tapestries we sat on a quayside facing large pyramids of salt, collected from the Stagone Lagoon a marine area with salt ponds, waiting, and waiting for a boat to take us to the Isle of Pantaleo, Motya. Eventually we arrived and went to the ancient site of Motya on the island of San Pantaleo. Moyta was first settled by the Phoenicians who apparently had a nasty practice of offering up their children and small animals as sacrifices, to appease their gods. At one point we found ourselves in the burial grounds crunching over thousands of tiny broken amphorae which apparently contained sacrificial bones. The historic remains were scant, but there was a sultry oppressive scented atmosphere which pervaded the place and the whole site was covered in poppies, wild flowers, scented herbs and bees. I suppose one could not shake off the thought of the terrible price people were prepared to pay for their misguided belief system. If anyone justifies their faith by saying, just believe, just have faith. I think the people of Motya must have had such an unflinching faith. What deeper horribly misguided blind faith can you have than the Phoenicians that lead them to sacrifice their children for the sake of their god? Selinunte. Selinunte sits on the west coast of Sicily. It was colonised probably as early as 651 BC, its name Selinunte derives from the wild celery which grows in the area. It is one of the most spectacular sights in the world. I thought I had gone to heaven. The first thing that strikes you is the sheer scale of the temples. There are eight temples. Eight! Each temple apparently bigger than the next. The sheer wealth expended by the citizens of Selinunte on these fantastic temples must have been at the cost of keeping up their defences, because the place seems to have been a battlefield for centuries. When it was finally abandoned in 250 BC, it is thought that the destruction of some of the massive temples could only have been done by earthquakes as it would have been impossible for men to have been prepared to expend so much time in toppling them. On the east hill there are three temples. 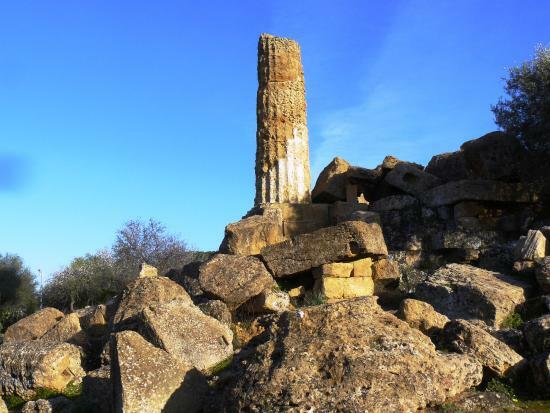 The best preserved one, dedicated to Hera, is known as Temple E. It is a Doric temple built in early 5th century BC and was fortunately re-erected in 1958. It is 222 feet long, with vast steps leading up to it, ten in front and six at the sides. Four beautiful metopes from this temple have been found and are now in the Palermo museum: Heracles killing the Amazon Antiope, the marriage of Hera and Zeus, Actaeon being torn apart by Artemis’ hunting dogs and Athena killing the giant Enceladus. The temple is a truly awesome sight. Temple F, the smallest and most ruined was built in 550-540 BC. Temple G is one of the largest temples ever built by the Greeks, and is dated 530 to 409BC. It is 113 metres long and the drums of each of the toppled pillars are massive. One has been re-erected. Why or why do they not attempt to re-erect the remainder of the pillars? The temple was never completed because in 409 BC the Carthaginians attacked and devastated the city and put most of its people to the sword. One wonders whether, if the Greeks had expended more of the time and energy on their defences rather than building yet another extravagant temple, they just might have not been conquered, if ever there was an example of the sheer stupidity of blind faith it is to be found in Temple E.
The earthquake that devastated the temple must have been incredibly strong to have shaken these gargantuan pillars which are piled up like children’s toppled building blocks. Again, as one sees too often at other ancient sites, people are standing on the pillars and children playing on them and all are slowly wearing them down. I hate to think what the crowds are doing to these temples now, when we visited we had the vast site virtually to ourselves. None of our photographs show any other visitors other than our small party. To the west of these three temples lies the Acropolis where you can see great defensive wall some of which are 10 metres high. On this part of the site are the remains of four temples, most are total ruins with the exception of Temple C whose north colonnade was re-erected in 1925. Some of the columns are 6ft 3 ins in diameter. It was a magnificent sight with an incredibly blue sea as a background. 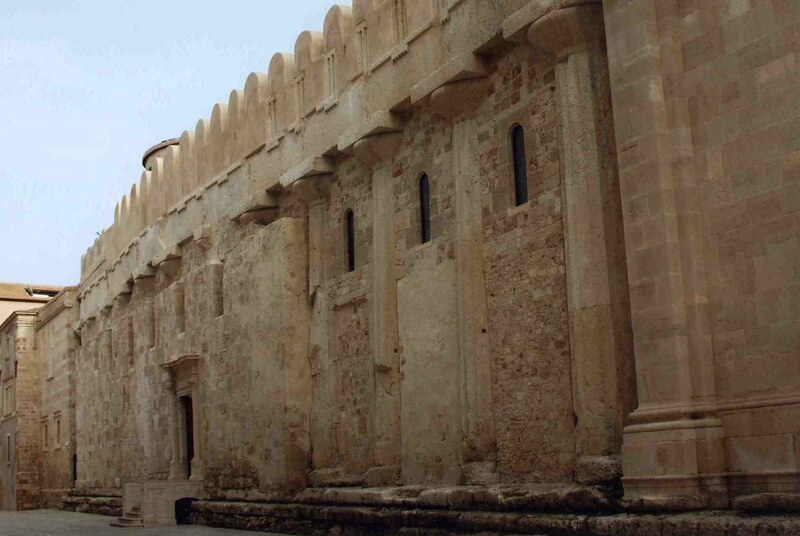 Some metopes were discovered from this temple and are now in the Palermo museum. Heracleia Minoa. There were excavations still in progress on this site which is situated on a magnificent hillside viewpoint overlooking the sea. The theatre, which is almost intact, has its seating covered in see-through plastic, the effect of which is absolutely horrible. There must be some other way of preserving the soft rock of which it is constructed. Apparently the site was settled by Minoan colonists. It was abandoned by the 1st century BC. We visited it in the late afternoon and everything was golden and the sea a dazzling blue. Agrigento. 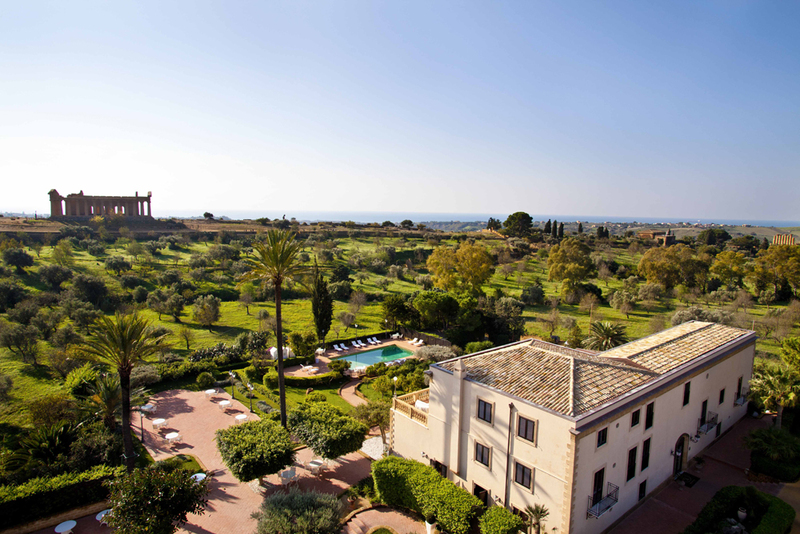 We stayed at the Hotel Villa Athena which overlooks the temples at Agrigento. It’s a truly awe-inspiring to see this row of temples on this huge ridge of rock. We arrived at the hotel in the late afternoon and before dinner a small group of us walked up to the temples and sat on the steps of the Temple of Concordia watching the stones turn to a golden colour as the sun set. All was very still and it was only our small party there. Truly magical. The following day we set off to visit the temples. There are four, one behind the other. The Doric Temple of Juno (460-440 BC) continues the usual sorry tale of destruction by earthquake. Fortunately 25 of the columns have been re-erected. The finest and best preserved is the next in line the Temple of Concord 450-440 BC. The temple was built at the same time as the Parthenon, though much smaller. Next is the Doric Temple of Hercules the earliest of the temples built in the late 6th century BC with nine columns eight re-erected in 1924 by Sir Alexander Hardcastle. Finally slightly apart from the others is the Doric Temple of Asclepius (late 5th century BC). It is close to the river and a medicinal spring. We then visited the Western archaeological zone. Here sit the sorry remains of the Temple of Olympian Zeus. Had it been completed it would apparently have become one of the wonders of the ancient world. Its dimensions makes it the largest temple every built by the Greeks. One of its extraordinary features was the setting of massive figures of Hercules in openings in the walls between the columns supporting the architrave. These were forerunners of the caryatids. Each figure was made out of stone blocks and covered in plaster and had its arms raised as though supporting the architrave. One, very decayed ‘Telamone’ lies on its back in the grounds of the site and another in a better state of preservation is in the museum. The temple was finished in about 406 BC when guess who, none other than the Carthaginians were at the door, and destroyed it. It was finally toppled by an earthquake and from then on was quarried for its stone mostly in the 18th century for the construction of the nearby harbour. The Temple of Castor and Pollux (early 5th century BC) is remarkable by its eye-catching remains of four re-erected columns and part of the entablature. Of the Temple of Vulcan, not much remains (late 5th century BC) built on the site of an earlier temple. The Archaeological Museum was well worth visiting. Magnificent collection with one of the gigantic Telamone, (25 feet high) which were set into the exterior of the Temple of Zeus. It has since been discovered that the legs were apart and not as reconstructed here. The temple must have been a wonder. Next to the museum is the church of S. Nicola (13th century) where a wedding was just ending, confetti and crowds everywhere. Next to the church are the remains of a Greek theatre. When the wedding departed we went to see the jewel of the church. The marble Phaedra sarcophagus (Roman 2nd century AD). 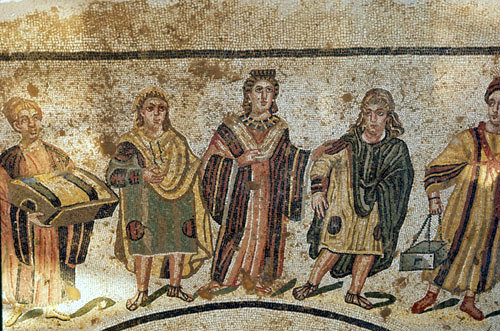 It shows moving scenes from the tale of Phaedra who fell in love with her stepson Hippolytus. On the front, Hippolytus about to go hunting received a message from Phaedra declaring his love for him. One ends show Phaedra’s grief at her rejection by Hippolytus and the other Hippolytus’ death, thrown from his chariot by a sea monster sent by Poseidon. Villa Palagonia, Bagheria (1705). Quite one of the most bizarre and incredible places we have ever visited. It’s Baroque/Gothic gone mad. The garden is full of statues, and I mean full, there were 200 but only 64 remain. Small statues of monkeys, dwarves with giant heads, dragons, animal-human hybrids. The story goes that the person who commissioned this motley collection of statues was one Ferdinand the Prince of Palagonia who was a hunchback and whose revenge on his wife’s lovers was to commission deformed caricatures of them and stick them on his wall. 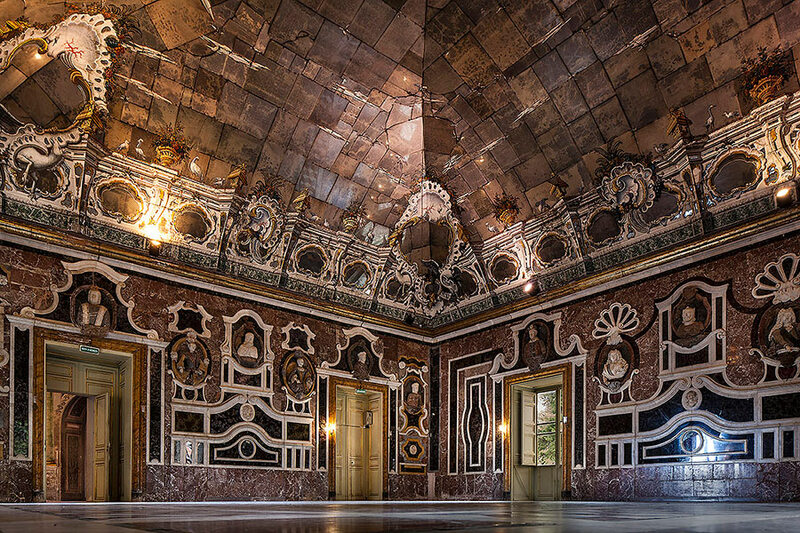 His revenge continued into the palace which was also bedecked with distorted mirrors which he had set in every door, wall and ceiling he could find. The state rooms are truly magnificent but the building looked like it was slowly falling to pieces in front of our eyes. I wonder how long before it finally crashes into ruin. and scenes from the Roman Circus, apparently the most extensive visual record of what went on as ‘entertainment’ in the Roman Circus. Then there are the famous girls in ‘bikinis’ doing gymnastics. Finally, in the waiting room to the baths, is a charming group of a lady who is presumably the mistress of the house and of the imperial family accompanied by her children a boy and a girl accompanied by two servants on their way to the baths. Syracuse. Our final destination on this extraordinary holiday was Syracuse. We stayed at the delightful Villa Politi Hotel built over a quarry which had been turned into a garden; the window of our room was covered in bougainvillea in full bloom. From here we visited the Cathedral which was reconstructed in the 7th century on the 5th century BC Doric Temple of Athene, twelve of the columns of the temple with their architrave and triglyphs can be seen jutting out of the walls of the cathedral. Nineteen columns from the temple can be found inside which had been stripped of its Baroque accretions. 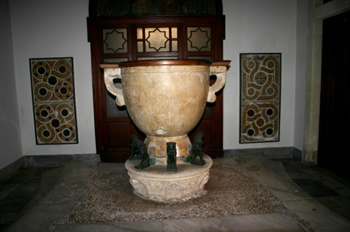 The Norman font is in the form of a Greek antique marble vessel, still with a Greek inscription, resting on seven bronze lions. and the marble sarcophagus of Adelphia (4th century AD) with portraits of Adelphia and her husband Valerius a magistrate. The Palazzo Bellomo is used as the Museum of Art. The jewel of the collection is the wrecked Antonella da Messina Annunciation (1474) whose beauty shines through it all. 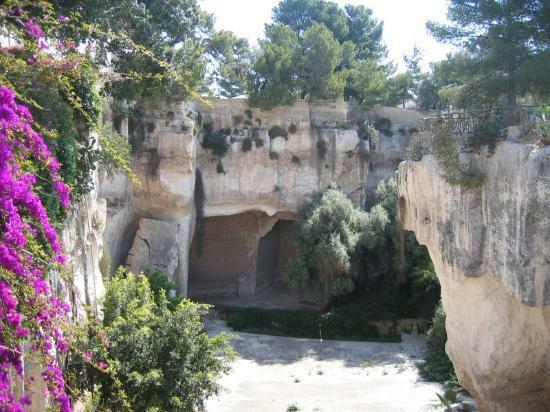 Then on to the Latomia dei Cappuccini one of the most extensive and vast old quarries in Syracuse. In here were imprisoned 7000 Athenians in the most appalling conditions after their capture at the unsuccessful siege of Syracuse (413 BC). It is now laid out as a garden. At this point, just a day before we were to leave Sicily and fly back home, William was struck by a travelling kidney stone, only we did not then realise it was a kidney stone on the move. We were both awake all night, he in considerably agony and kept retching and retching. Not knowing at the time what was happening, was one of the worse things about it. A doctor was called who gave him some medicine which we could see from the label contained morphine. And then two of the cleaning ladies turned up with a needle, saying the doctor has asked them to administer an injection to William. There was no way that was going to happen and after a great deal of shrugging of shoulders they left. Somehow the morphine calmed the pain so it must have been a pretty strong dose, but William decided not to go out on the last day of the holiday but instead stayed in our delightful bougainvillea bedecked room in the hotel. Neapolis and Noto. William insisted I go off with the party for the day, so reluctantly I went. We were taken to the Neapolis area of the city. Saw the elliptical amphitheatre. Then on to view the vast Altar of Hieron II (212 BC). This was used for animal sacrifices in honour of Zeus. 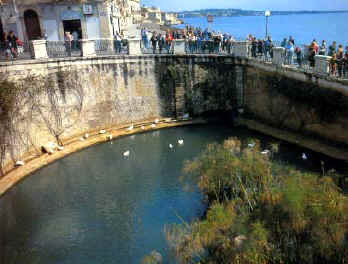 It has been stripped of all its adornments of columns statues, etc., by the Spanish in the 16th century to serve as fortifications for the island of Ortygia. The altar was 650 feet long and 79 feet wide the largest known altar. The slaughter of animals must have been on a gargantuan scale. 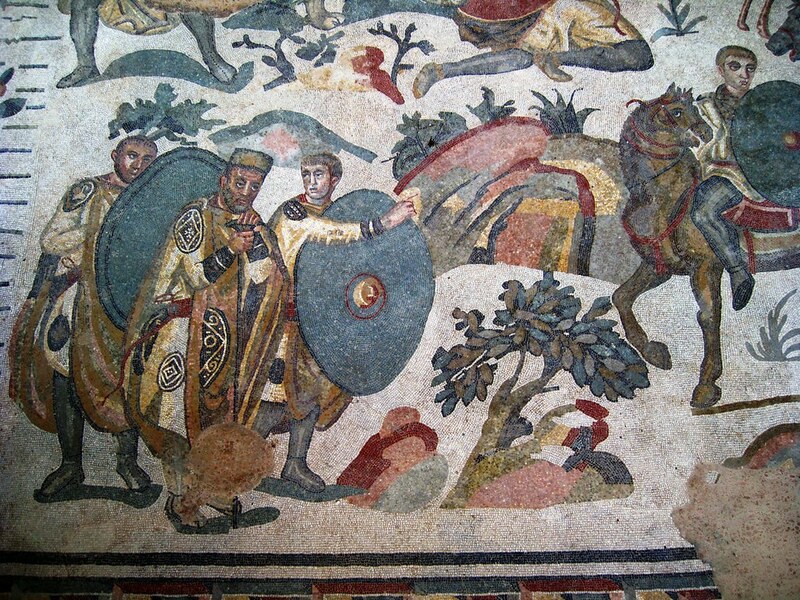 According to the historian Diodorus 450 bulls were once sacrificed at the same time. Next we visited the Greek theatre, the largest Greek Theatre known, with 42 rows of seats. The first production of The Persians by Aeschylus was performed here. In its final enlargement the theatre could seat 15,000 people. Finally we visited the vast ruins of the Euryalus Castle. Built as a defence against the Carthaginians, the whole site seemed a mess of ruined stones and I could make neither head nor tail of it. Archimedes helped to design part of the defences but was bumped off by a Roman soldier during the siege of Syracuse apparently while still engrossed in a mathematical problem he was trying to solve. Euryalus Castle. Looking somewhat bewildered, notwithstanding my guidebooks which were of little or no help. Also now extremely worried about how William was getting on at the hotel. In the afternoon we visited the 18th century Baroque town of Noto with its pretty balconies and facades. Inside the Crofifisso church are two delightful antique lions. But I was longing to get back to the hotel to see how William was faring. As I walked down the corridor of the hotel, I could hear him retching and retching. Apparently he had been doing this for most of the day and was exhausted. Fortunately, sometime during the night he must have passed the kidney stone because he seemed to be better if somewhat weary and we decided we would risk the journey home. Fortunately, though still in a weakened condition William managed to get as far as the customs check-out. Here our bags were emptied and of course they found the bottle of medicine with the fatal word morphine on it. The Customs officer had a mild fit and started waving it about and causing a great scene, poor thing it was the most interesting find he had probably had all day. We were in no mood for all this fuss and pointed out that it was a prescribed medicine with the doctor’s name on it and if they cared to call him… Eventually after a great deal of commotion, many officials summoned and with everyone held up behind us looking impatient, William told him to confiscate the bottle as he had no further use for it and its illegal contents. This seemed to satisfy everyone and we went through. We often wondered if they all had a swig from it after work. We flew safely home and many months later when the same symptoms struck William, it was diagnosed as dislodged kidney stones which come with extreme pain as William can attest. Mother goes to Greece with Dorothy. My mother wanted to see Greece so set off on a tour with her old friend from school, Dorothy Lynch, now Buckley, on a two week tour. By all accounts the visit was successful and like us they had been to the Acropolis in Athens and one can see from the photographs that there were no crowds. One thing they did see which we never managed to was the 6th century BC Temple of Aphaia on the island of Aegina. June 1979 Anne. Anne got married to her second husband Frank Henry Duffield and they acquired and settled down in a flat in Leytonstone. He was considerably older than her, but I think she felt in safe hands. They both had been divorced and had met at their place of work which was a pharmaceutical company.